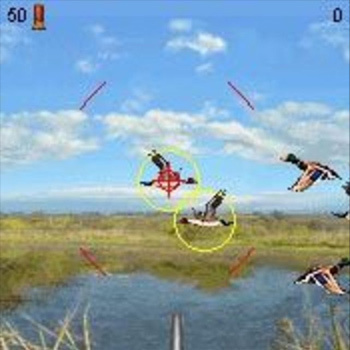 Duckshot is a quixotic puzzle game which challenges players to take their best shots in creating cascading bonuses by shooting groups of similar ducks. Look out for endangered swans as you strive to QUACK up your game letter by letter by shooting 3 or more ducks at a time, and increase the number of ducks on your screen. Players can earn rewards for their hard work and expert shooting, including collectible hunting stamps awarded upon advancement to each new round and those skilled enough to shoot the Golden Snipe will be able to collect a top secret bonus. The pace quickens with each stage and players can continuously upgrade their weapon by solving puzzles throughout the game.